A common question for a patient newly diagnosed with obstructive sleep apnea prescribed CPAP treatment is what the masks look like. CPAP is the gold standard treatment for sleep apnea prior to considering any type of surgical treatment. 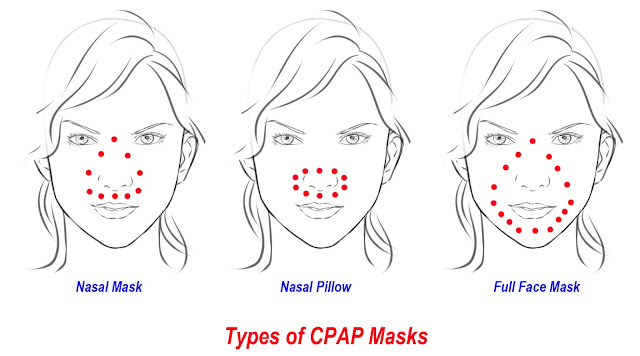 In essence, there are 3 different flavors of CPAP masks illustrated below. Due to the huge variation in face shapes and sizes, there is no "best" CPAP mask and often, a patient may need to try different styles, size, and strap placements before finding one that works and fits the best. For each mask style, there are many variations with respect to strap placement, mask size, and tube placement. With respect to tube placement, it typically comes from either the side or is looped up over the forehead. The pics below demonstrate a few basic styles for each mask type. The first column shows full face masks, the second column shows nasal masks, and third column shows nasal pillow masks. Once you receive your CPAP machine from a durable medical supply company, you should be able to work with a respiratory therapist to find a mask that is best for you.